Razzy Navel Smoothie is a light and healthy, gluten and dairy-free sweet treat for breakfast or a snack! Happy Friday everyone – raise your hand if you’re doing a Friday dance!? Just me? Just fine. I’m still flying high from the sweet, 5 ingredient smoothie recipe I’m sharing with you today. Razzy Navel Smoothies are going to get you out of this winter funk and straight onto a warm beach, if only in your mind. Tiny paper umbrella optional! Seriously though, this might be the shortest post in IGE history. Just one process pic, people! Not much to a smoothie recipe besides throwing stuff in a blender then pushing, uh, on. Love it. That said, let me elaborate on that “stuff” real quick. A couple years ago when Ben and I went to Jamaica, the resort’s beach bar plunked onto the warm white sand (which we always laid our loungers next to, naturally,) was abuzz all day long with blended fresh fruit smoothie/cocktail combos like Pina Coladas and Fuzzy Navels. 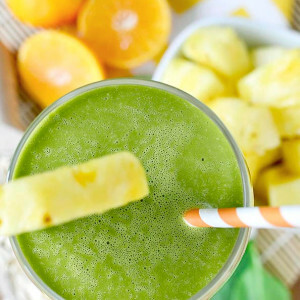 I’ve been thinking about that tropical paradise a lot lately, courtesy of our current chilly circumstances, and was inspired to mix up my own beachy smoothie at home – sans alcohol – to sip as a light and fruity breakfast, or perfectly refreshing snack. 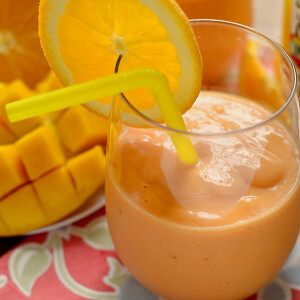 Razzy Navel Smoothie is a twist on the classic fuzzy navel combo of peach and orange. 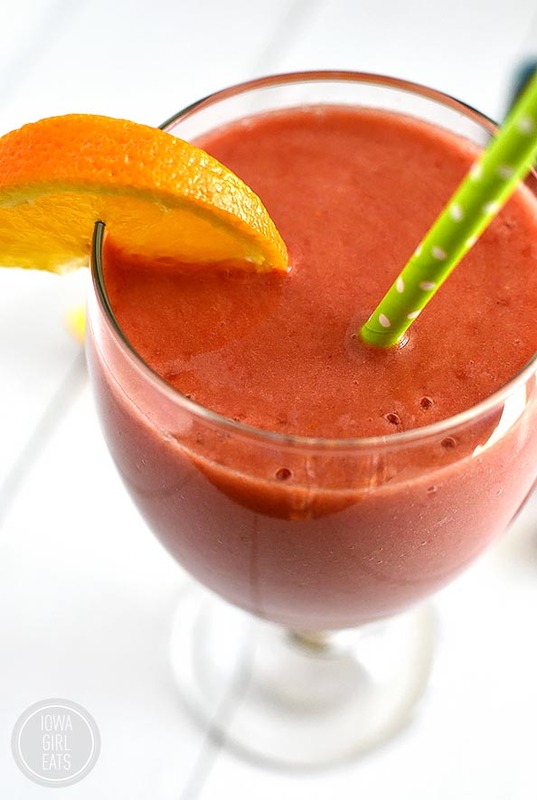 I added frozen raspberries to the mix for a hit of bright color, then blended them with frozen peaches, a fresh orange, a banana, and orange juice. 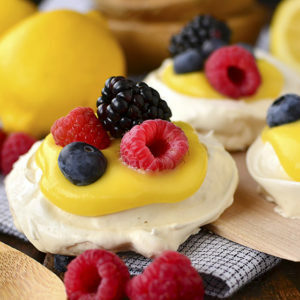 This cocktail-inspired combo is so, so delicious. 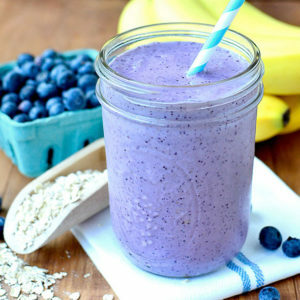 I loved the banana for giving the smoothie an even more tropical taste, but if you don’t do bananas you could swap in raspberry or peach Greek yogurt to get the thickness they usually lend. 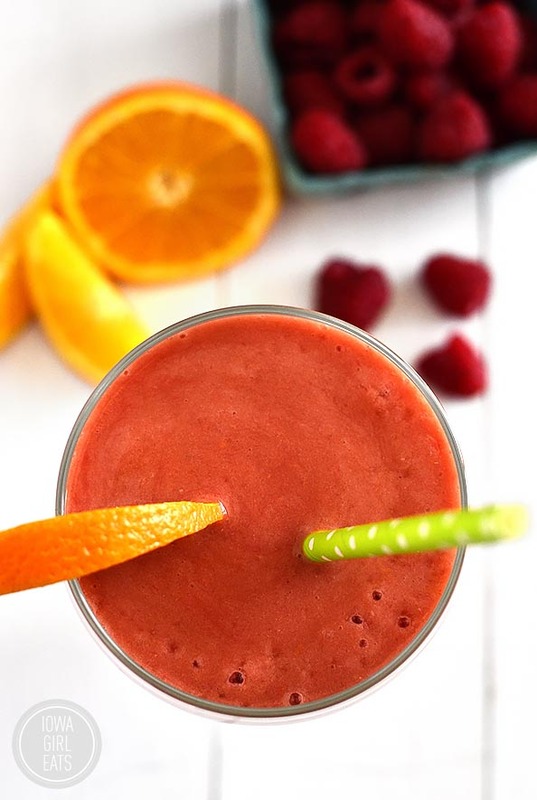 Simply add 1/4 cup orange juice (I like Simply Orange which has no added sugar,) 1 peeled orange, 1 fresh or frozen banana, and 1/2 cup each frozen raspberries and peaches, into a blender then blend until smooth, and pour into a tall glass. 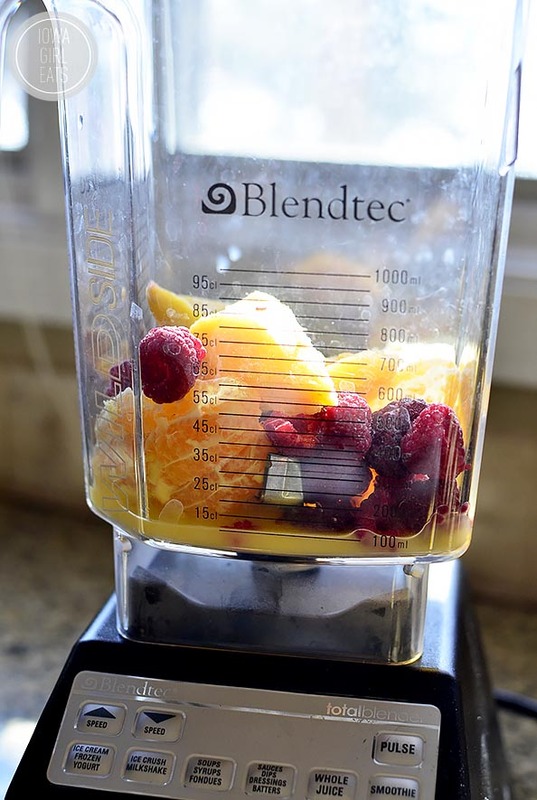 Add ingredients listed in the order above to a blender then blend until smooth. Yumm!!! This is just what I need to pull me out of my winter funk! I think I’ll be trying this over the weekend with a little splash of peach schnapps, as you suggested, to get the full island getaway effect. The mere mention of a fuzzy navel just toko me back… way back! So fun and retro! 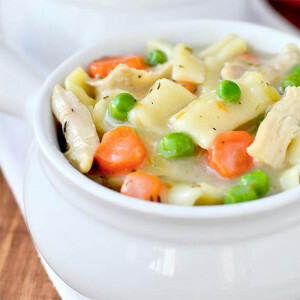 I recently moved to Colorado (from California) and am having so much trouble getting enough food from the grocery store and planning meals before snow/ bad weather makes it too hard to go out. I’d love to read about how you stock your pantry and meal plan for the week- you make it look so easy! This looks PERFECT for the snowy grey day I’m having to endure right now. Do you think it would be any good if I included some greek yogurt to give it more staying power for a breakfast? As soon as Lent is over, I’m taking you up on that rum addition suggestion. For now—this is rad, as is. Good stuff! 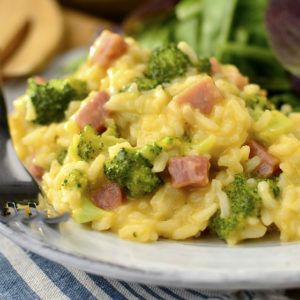 This looks and sounds fab! I am one of those banana haters. How much Greek yogurt would you suggest? One of the single serving containers or about 1/2 c if it’s coming from a larger tub? 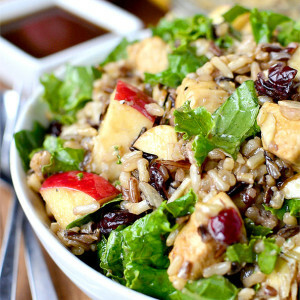 This looks pretty dang good. I am a fan of smoothies before workouts. I find that they give me the calories and energy, but aren’t to heavy in my stomache for running. I will have to try this. I like that there are only a few ingredients. Made this smoothie this afternoon (as it’s sleeting outside). 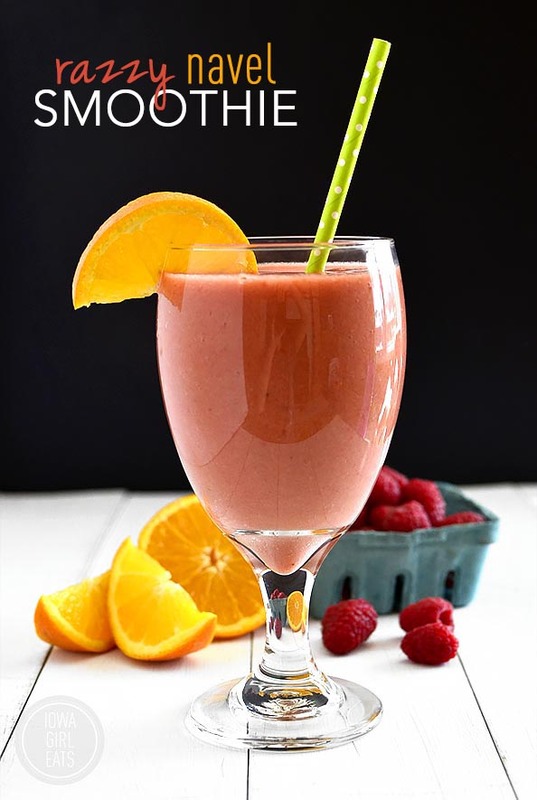 Loved it – just the right amount of tang from the raspberries and the banana is not overpowering. The color is gorgeous, too! Great pick-me-up to get me through the rest of this never-ending winter! Thanks! 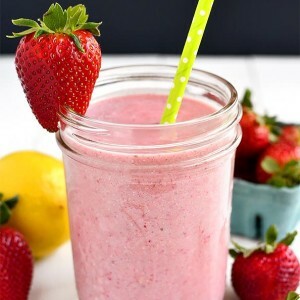 Hi Ms Kristin,First of all I want to thankyou for share this extraordinary and healthy recipe.Im a fan of outdoor activities like running,biking, beautifull beaches and natural blends of fruit shakes including smoothies,so I want to recomend you some beautifull places in Puerto Rico that are suitable for your income or vacational butget.